In consideration of the six claims (see figure 1), Probe transferred four isolated mining claims, comprising its Beaufor West property, to Richmont. The claims are located wholly within Richmont's Beaufor Project and were considered non-core to the Val-d'Or East project. Probe Metals Inc. is a leading Canadian gold exploration company focused on the acquisition, exploration and development of highly prospective gold properties. 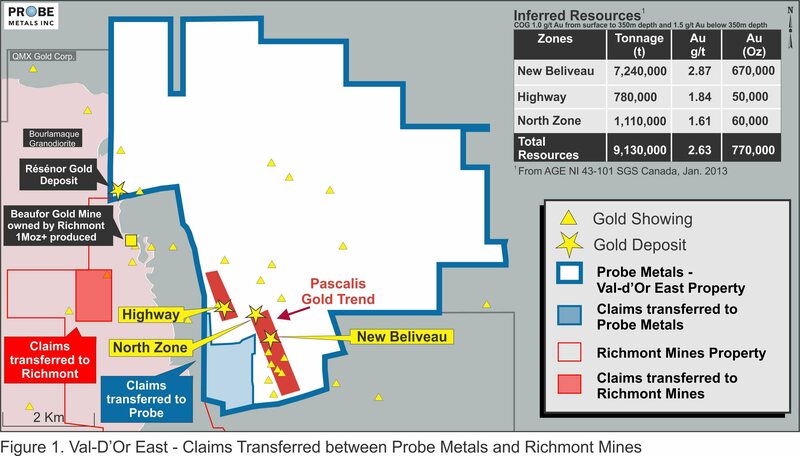 The Company is well-funded and controls a strategic land package of over 1,000-square-kilometres of exploration ground within some of the most prolific gold belts in Ontario and Quebec: Val d'Or, West Timmins, Casa-Berardi and Detour Quebec. The Company is committed to discovering and developing high-quality gold projects, including its key asset the Val-d'Or East Gold Project. The Company was formed as a result of the sale of Probe Mines Limited to Goldcorp on March 13, 2015. Goldcorp currently owns a 14% stake in the Company.